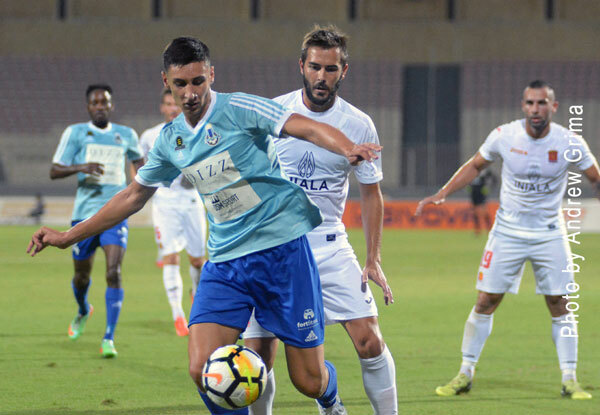 Tarxien Rainbows moved a step closer to securing a place in the Championship Pool thanks to a narrow win over Hibernians in the derby. They move five points ahead of Hamrun and Floriana, who however have a game in hand. It was a deserved win for Noel Coleiro’s side as they were the better team throughout the ninety minutes. Hibs disappointed as they have now gone five matches without a win. The Rainbows were in full strength. 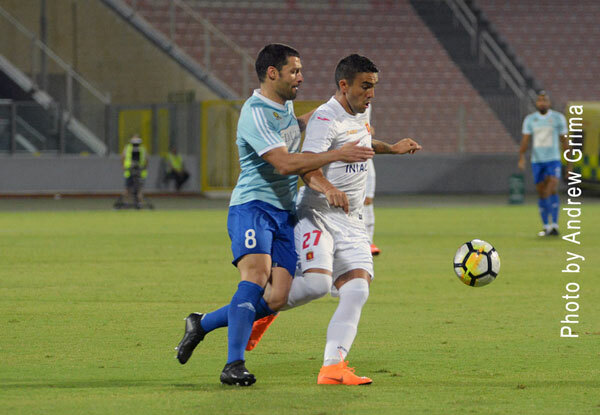 The Paolites, on the other hand, lacked Christian Callejas but Mario Muscat and Aaron Xuereb were back after serving a one-match ban although the latter was retained on the bench. Hibs had the first attempt at goal after just three minutes when off a Triston Caruana freekick, Miguel Lopes De Pina headed just over the bar. Tarxien replied with a shot by David Camilleri from the edge of the area which was parried by Mario Muscat six minutes later. On 35 minutes, Denni Rocha Dos Santos had a fine effort from outside the area denied by Mario Muscat, aided by the crossbar. In added time, Chris Camilleri brought Denni Rocha Dos Santos down inside the area. Referee Marco Borg ordered a penalty and from the penalty spot, Denni Rocha Dos Santos converted to put Tarxien ahead. Four minutes in the second half, the Rainbows went close with a powerful shot from the right by Justin Grioli. A freekick by David Camilleri was saved by Muscat in two attempts on 57 minutes. On the other side of the pitch, Andrew Cohen headed just wide off a cross from the right by Yan Cauchi on 77 minutes. In stoppage time, off a Triston Caruana corner from the right, a header by Miguel Lopes De Pina was parried by Tarxien goalie Anthony Curmi. David Camilleri was voted BOV Player of the Match. HIBS Mario Muscat, Jonathan Caruana, Edward Herrera (46′ Yan Cauchi), Adrian Pulis, Jonathan Pearson, Triston Caruana, Elton Morelato (72′ Ben Camilleri), Etienne Barbara, Andrew Cohen, Miguel Lopes De Pina, Chris Camilleri (46′ Elkien Cauchi). Subs not used: Daniel Balzan, Ryan Camilleri, Aaron Xuereb, Matthew Tabone. 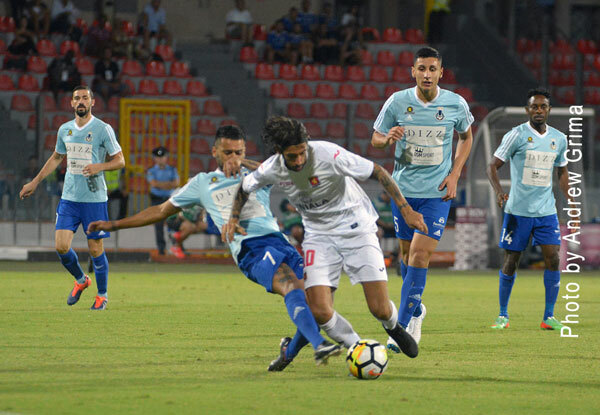 TARXIEN Anthony Curmi, Steve Sadowski, Manuel Caruana (69′ Kurt Magro), David Camilleri, Everton Antonio Pereira, Anderson Mendes Ribeiro, Mark Tanti (80′ Luke Vella Critien), Andrew Decesare, Denni Rocha Dos Santos (51′ Gianluca Calabretta), Ryan Mintoff, Justin Grioli. Subs not used: David Cassar, James Shead, Ryan Grech, Lee Galea. Meanwhile in the second game game, Valletta moved back on top thanks to a 4-0 win over Hamrun Spartans. The Citizens held the initiative right from the start with Hamrun trying their best to control their opponents. 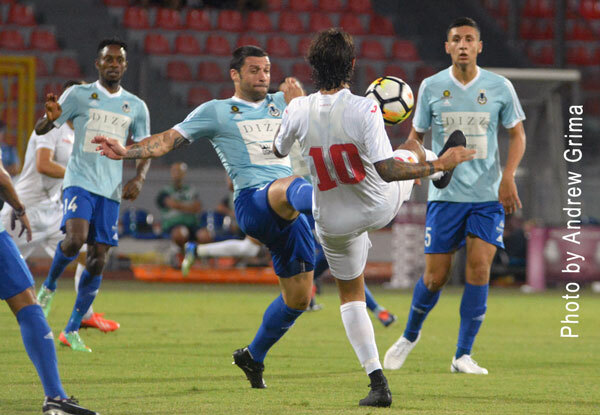 The Spartans were unable to field their best formation due to the absence of Roderick Fenech, Rupert Mangion and Ian Zammit – all suspended – besides the injured Jonathan Holland. 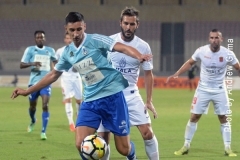 Kenneth Scicluna was missing for the Citizens through suspension but Luke Dimech was back after serving a one-match ban. 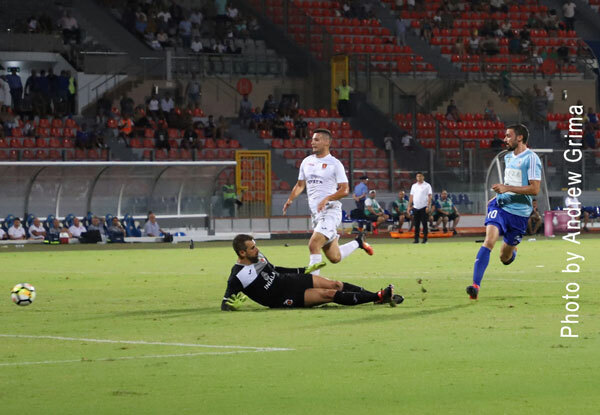 Valletta had the first attempt at goal on 5 minutes when off a Kevin Sammut freekick from the right, Terence Scerri’s fine header was neutralised by Ivan Casha. Hamrun replied with a shot from outside the area by Gaetan Spiteri which was turned into a corner by Hogg on 14 minutes. On 29 minutes, a Terence Scerri close-range effort was blocked into a corner by Casha. Five minutes later, a diagonal shot by Gilbert Agius from right ended just wide. Six minutes from the end of the first half, Valletta took the lead when Njongo Priso concluded a good move with a pass for Jamie Pace whose fine shot from outside the area beat goalkeeper Ivan Casha. After the break, the Citizens were clearly in control, going close with a Terence Scerri header on 58 minutes following a cross from the left by Steve Bezzina. A minute later, a low shot by Scerri was parried by the Hamrun custodian. On 65 minutes, Priso, served by Bezzina on the left, hit incredibly high from the edge of the area. A freekick from the left by Kevin Sammut was neutralised by Casha on 72 minutes. Two minutes later, Scerri, served by Priso, tried his luck with a low shot which scraped past the post. 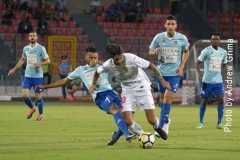 Valletta doubled the score on 75 minutes when a shot by Terence Scerri from the left was not held by Ivan Casha and Gilbert Agius hit home from close. Five minutes later, Terence Scerri headed the ball home from close range following a cross from the left by Njongo Priso. Substitute Declan O’Brien went close on 82 minutes with a diagonal shot from the right which was partially saved by the Hamrun goalkeeper. Terence Scerri made it 4-0 on 87 minutes when he placed the ball at the back of the net from close range after receiving a pass from the right by Declan O’Brien. One minute from time, Njongo Priso was sent off for Valletta after hitting Gaetan Spiteri in the face. 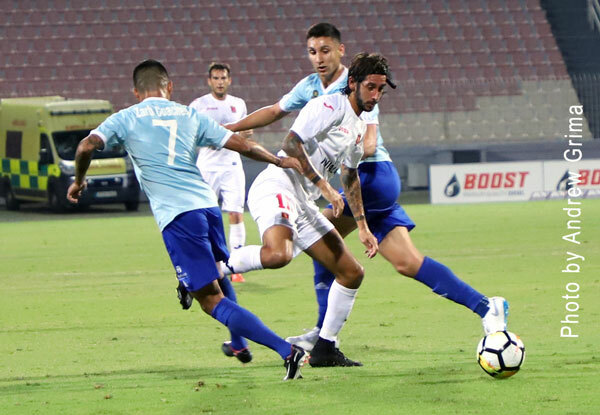 VALLETTA Andrew Hogg, Steve Borg, Steve Bezzina, Luke Dimech, Jordi Cruyff, Kevin Sammut (81′ Declan O’Brien), Gilbert Agius (90′ Clifford Gauci), Roderick Briffa (83′ Dyson Falzon), Terence Scerri, Jamie Pace, Njongo Priso. Subs not used: Nicky Vella, Cleavon Frendo, Edmond Agius, Dylan Grima. HAMRUN Ivan Casha, Mark Anthony Bonnici, Aaron Attard (78′ Lee James Agius), Manolito Micallef (85′ Dalton Caruana), Diego Cucciardi, Mead Mifsud, Marcelo Pereira (81′ Mauro Busuttil), Gaetan Spiteri, Martin Hrubsa, Joao Mawete, Clyde Camoin. Subs not used: Andrea Cassar, Glenn Azzopardi, Karl Magro, Neville Galea.